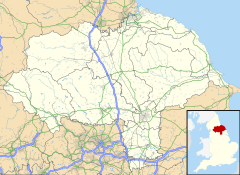 Wilton is a small village in the unitary authority of Redcar and Cleveland and the ceremonial county of North Yorkshire, England. As the population was less than 100 at the 2011 Census details are kept in the ward of Dormanstown. It is located between Redcar and Eston at the base of Eston Hills – to the east of Eston Nab. The village is noted for its golf course and castle, Wilton Castle. It lies just south of the A174 trunk road. On the other side of the A174, is the village of Lazenby. The parish church is dedicated to St Cuthbert. Wilton Castle was sold to ICI in the 1940s. Wilton Castle is an early 19th-century mansion house, built on the site of a medieval castle, now converted into residential apartments. It is a Grade II listed building. The Bulmer family owned the manor of Wilton in the 13th century and were granted a licence to fortify their manor house in 1210. In 1331 Ralph Bulmer was granted permission to build a castle on his manor. The estate was confiscated by the Crown following the attainder and execution of Sir John and Lady Bulmer for high treason arising out of their part in the Pilgrimage of Grace in 1536. The manor was restored to their son but was lost again, by sequestration in 1644, following Sir William Bulmers opposition to Parliament during the English Civil War. It was again later restored but the castle had been sleighted by Parliamentary forces and made uninhabitable. The estate was purchased in about 1806 by John Lowther of Swillington, brother of the Earl of Lonsdale. Lowther demolished the remains of the medieval castle and built, in about 1810, an imposing mansion house on the site, to a design by architect Sir Robert Smirke. The Gothick design includes a fifteen bay frontage with a four-storey castellated tower at the centre, flanked by castellated and gabled bays and turrets and five bayed two-storey wings. Lowther was created a Baronet in 1824 (see Lowther Baronets). On the death of the third Baronet in 1894 the Baronetcy passed to his grandson but the Wilton Castle estate passed to his younger son James Lowther. The family sold the property in 1945 to Imperial Chemical Industries for use as offices occupied at various times by major industrialists such as Richard Beeching and Sir John Harvey Jones. The park was developed as a golf course for ICI staff. ICI sold it in 1999, after which the golf club was acquired by its members and the castle converted into residential apartments. ^ "Wilton Parish Church:: OS grid NZ5819 :: Geograph Britain and Ireland – photograph every grid square!". Geograph.org.uk. Retrieved 3 April 2013. ^ "Wilton Golf Club History". Wilton Golf Club. Retrieved 18 November 2016. Wikimedia Commons has media related to Wilton, Redcar and Cleveland.